That’s how Superintendent Ken Gifford describes his Arthur Hills Thoroughbred Golf Club at Double JJ Resort when asked to sum up the sprawling layout and hidden Michigan gem that marks its 25th anniversary in 2018. The shining jewel of the 3,000-plus acre Double JJ Resort located six miles west of Lake Michigan and 30 minutes north of Grand Haven, the Thoroughbred course annually ranks as one of West Michigan’s top golf experiences, with a 4½-star rating out of 5 by Golf Digest Places to Play. The resort features an incredible variety of accommodations ranging from western rustic to modern lofts and condos – catering to golfers, couples, families and corporate personnel alike. A wide range of activities from swimming to horseback riding are available, and the resort is also popular for winter recreation “As far as the golf course, it’s just drop dead gorgeous,” said Gifford, who has been busy getting the Thoroughbred back into pristine condition since coming to the Double JJ last fall. “The elevations changes and the way the holes cut through dense forest and wind through a series of beautiful lakes and bogs, it’s just a special place to be. It’s a good test of golf to players of all skill levels.” A native of the Adirondack Mountains area in upstate New York, Gifford has worked at some of the country’s top courses, including New York’s exclusive Tuxedo Club and Arcadia Bluffs, in nearby Arcadia, MI. The Arthur Hills Thoroughbred Club will celebrate the upcoming 25th anniversary by turning back the clock and offering the same greens fees this spring that were offered when the ribbon was first cut back in 1993. Prior to Memorial Day, the course is offering a $30 rate Monday thru Thursday and $40 Friday thru Sunday. Along with newly hired head golf professional Chris Cullen, a Professional Golf Management graduate from nearby Ferris State University who worked at the course when it opened, Gifford will play an integral role in the Thoroughbred’s return to greatness this season. 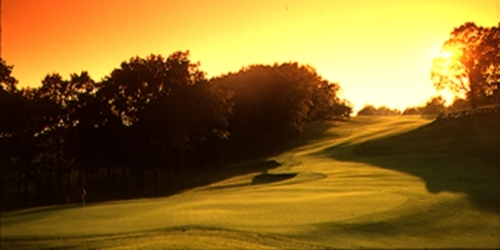 -continued- The par 72 course features bent grass, four sets of tees, and plays between 4,779 and 6,887 yards. Lush fairways are bordered by trees, lakes, marshland, mounding, and often lead to sloping green complexes that feature ridges, tiers and undulations. There is a mix of conventional and pot style sand traps, some with sod walls that result in difficult recoveries. As with any championship design, accuracy on approaches is necessary to score well. The Thoroughbred offers an amazing diversity of features and many holes that can be considered ‘signature.’ Standouts include the dramatic 2nd hole, a 425-yard, mind bending par 4 that wraps around a beautiful cranberry bog and is featured in Jeff Barr’s book 1001 Golf Holes You Must Play Before You Die. Rounds conclude with the memorable 18th hole, a sweeping par 5 dogleg that can play upwards of 565 yards. With a landing area off the tee that can narrow to just 25 yards wide, golfers will find water on the left and woods on the right. The Double JJ Resort is an all-season destination resort located off Exit 136 from US 31 in Rothbury, Michigan, just 30 miles north of Grand Haven.